The ongoing art project A portrait of a Nation by Trond Hugo Haugen consists of several elements. The artist's starting point is found in the iconic painting Eidsvold 1814 (1885) by Oscar Wergeland. The painting shows the 112 representatives in the Constituent Assembly who established and adopted the Norwegian Constitution 200 years ago. The painting is a famous picture which represents Norway becoming an independent country. Around 70 of the 112 delegates that were present are painted in enough detail to be identified. 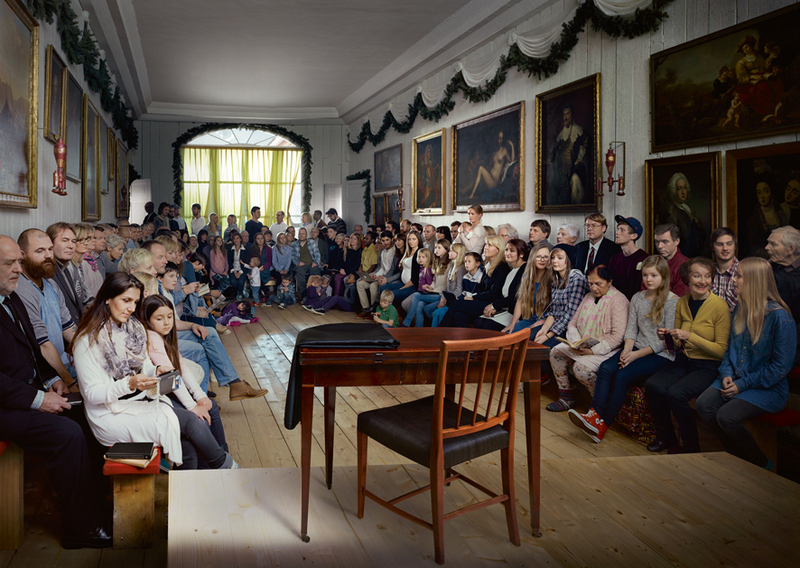 The photograph A Portrait of a Nation (after Eidsvold 1814): Coinciding with the bicentennial anniversary of the constitution, artist Trond Hugo Haugen has created a photograph with a statistically correct representation of contemporary Norway. The Norwegian population has been scaled down to 112 people to match the number of representatives present in 1814. The photograph represents Norway in 2014 to cover gender, age, ethnicity, occupation, belief and sexual orientation. "The people in the photograph are us. 112 of us, the same as the number of representativesin that first constitutional assembly, as shown in Oscar Wergeland’s painting from 1885, but the people in the photograph represent Norway in 2014. We are as many women as men, 57 of us are working age, two unemployed, six students. Only one farmer. Most of us are ethnic Norwegians, 13 with immigrant backgrounds, most from Poland. One is Saami. Six are queer, one is pregnant. The people in the photograph live in Norway." Please see the main page for more writings, links to reviews / publications and downloads. This artwork is protected by copyright. You can download it and make it available in all media and formats. If the artwork is made available, the name of the creators must be stated in the follo wing manner: © Trond Hugo Haugen/BONO 2014 and Photo: André Severin Johansen. You are not allowed to make a copy of the artwork that may be perceived as an original. The artwork can not be commercially exploited. If you use the images on web pages, please link back to www.riksportrett.no. If you require the images in TIFF format, please contact us by email.